This map is surveyed by Richard Blome, a heraldic writer and cartographer. Although prolific, he was something of a magpie, borrowing from many sources in the creation of his maps. 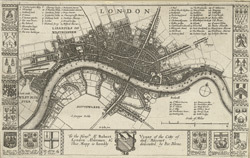 Engraved by Hollar, this map is dedicated to Sir Robert Vyner, whose coat of arms is depicted at the bottom. The arms of the 12 Great City companies are drawn in the side margins. These companies were the trade guilds of London, many of which have existed from the middle ages to the present day.